Sharks don't rely strictly on their size and formidable jaws for self-defense. These well-adapted predators are able to outsmart and outswim their foes, as well -- because sharks are preyed upon by other sharks, these are critical defense mechanisms. To protect himself in the wild, a shark has to rely on all of his senses, cunning and strength. Sharks are highly intelligent creatures, and they use that keen intellect to defend themselves and more effectively hunt their prey. This is a product of adapting to the hunt, as the animals on which sharks frequently prey, like dolphins and seals, are also intelligent. For example, some sharks consciously sink to the ocean floor, camouflaging themselves to avoid detection. The shark also benefits from highly attuned senses, using his finely tuned powers of sight, smell and hearing to detect nearby threats and potential meals. Because of both his sharp mind and his excellent vision, the shark is able to communicate using body language, preemptively defending himself by attempting to prevent violent confrontations. While they are fierce predators, when not in pursuit of a meal, sharks are not inherently violent creatures -- when one feels threatened, he signals his unease in an attempt to defend himself by communicating distress. By lowering his pectoral fins, for example, he communicates to a potential attacker that he feels threatened, sending a message before the confrontation comes to blows. 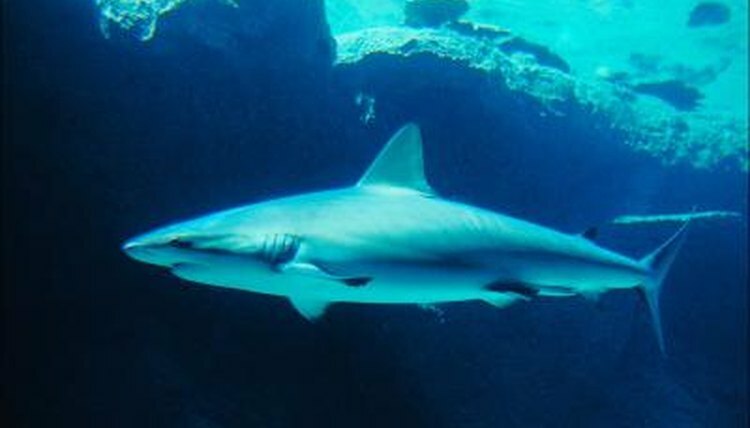 The same adaptations that make sharks powerful hunters also enable them to defend themselves -- particularly, his speed. Sharks are notably fast swimmers, and they use that speed to escape potentially dangerous situations. For example, the great white shark can reach speeds as fast as 43 miles per hour, and when confronted with a "fight or flight" situation, he may simply choose the latter as a pragmatic self-defense maneuver. In a physical confrontation, a shark defends himself using a variety of tactics. Using a combination of powerful body slams and vicious bites, sharks pummel, disorient and tear apart their enemies. In some cases, the best defense is a good offense -- sharks frequently rely on surprising their prey and would-be foes, sneaking up on them from underneath to give themselves an advantage from the outset of the fight.